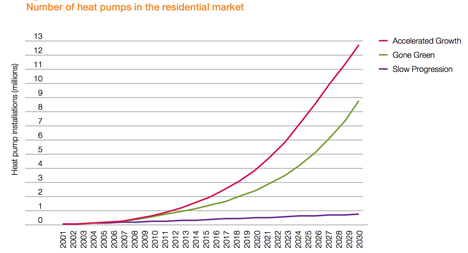 We have reached, I would suppose, a period of complacency in the perception of the coming of Peak Oil. We are in a period where, as recent posts have shown, the promises of bountiful supply are built on increasingly tenuous propositions. Unfortunately the evolving story of the mess that we are heading into is at a point where the critical aspects of the problem rate minor paragraphs in articles that largely talk about something else. And the potential of the fossil fuels that lie within shale have commentators drooling over the benefits that will come from this abundant resource. Unfortunately within this euphoria there are sufficient concerns that need airing, since, overall, the situation has not changed that much since the Hirsch Report was published, just over eight years ago. One of the points that was made in that report was that it would take some twenty years for new technologies to mitigate the foreseen shortages of liquid fossil fuels, made when gasoline prices averaged some $2 a gallon. Driven by concerns over climate change, there has been a significant effort to find alternate fuel options that can provide a renewable option. And the hopes for these producers lead to predictions of a different future. We conclude that further new projects to build coal-fired generation in Germany, the Netherlands, and Spain are all very unlikely. The three major oil companies each had different technologies on which they hung their hats to ease any fears of the future – including the widespread development of either methane hydrates of the oil shales of Colorado. (Neither of which can be realistically expected to come to pass in the next twenty years). 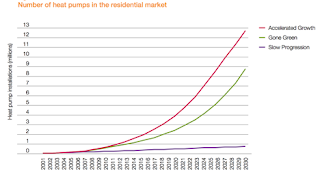 The British National Grid in their view of the future seems to put is faith more in the widespread use of high-efficiency heat pumps. 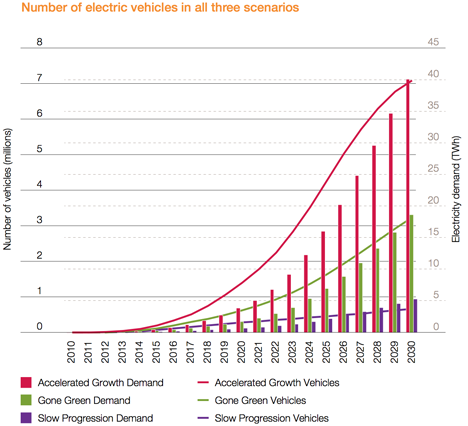 The also anticipate considerable growth in future sales of electric vehicles, though admitting that their earlier projections for these numbers were overly optimistic. In the Slow Progression scenario developments in renewable and low carbon energy are comparatively slow, and the renewable energy target for 2020 is not met until some time between 2020 and 2025. The carbon reduction target for 2020 is achieved but not the indicative target for 2030. The concern with these optimistic projections, is that it also impacts the investment strategies of those who will need to supply those fuels in the future. Just as it takes time and money to build a power station, so it also takes time to permit and build a coal mine, or an oil or gas well, and the infrastructure to support it. 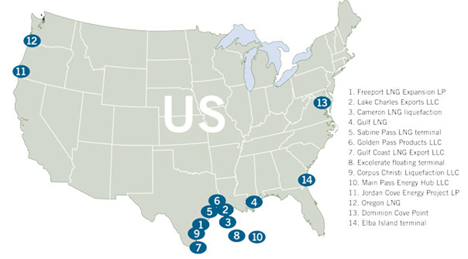 The current situation in the United States has proponents of the natural gas boom urging the development of export terminals to ship LNG to a global market at a very competitive price. By last December there were plans for a dozen such terminals in the works. This additional supply, and the likely impact of cheaper natural gas into the European market, has already caused Gazprom to rethink its strategy for natural gas development over the next few years. The major Russian current development is taking place in the Yamal Peninsula, where the Bovanenkovo field, which came on stream last October had been projected to yield 4 Tcf by 2017, increasing 5 Tcf in the out years. Other adjacent fields, Kharasaveyskoye, Kruzensternskoye, Tambey and Nonoportskoye, were scheduled to follow in order to meet anticipated demand. But those plans are now being scaled back. Russia has already lost some of their Chinese natural gas market to Turkmenistan, and now it can see that the US might take some of the European market. It cost $41 billion to develop Bovanenkovo, which made it “one of the most expensive industrial projects in the world.” Gazprom is cutting production by to around 83% of capacity this year, and expects it may have to go lower. The natural follow-on to this will be a slowing of investment and development in Yamal, which also produces oil. At present Russia is closing in on a record post-Soviet oil production () reaching a level of 10.49 mbd (the Soviet peak was 11.48 mbd in 1987). Rembrandt recently noted that it is going to take a significant and ongoing investment in order to have any hope of sustaining those numbers. My concern is that, in the current Western euphoria, those who must invest to build the alternative infrastructure that will provide sufficient fuel, if all the current plans and projections for alternative supplies and conservation fail, will not b motivated to make those investments in a timely manner. If they do not, or have not, then we will still need the 20-years that Robert Hirsch and his committee projected, when we run out of that time. (That clock is ticking). Unfortunately those who, like Cassandra, sing this song are less likely to be heard in this interval.